Big Boys Lead Brewers Over Braves ~ The Bucky Channel - The World of Sports from Wisconsin's Perspective. If there was ever time to use the expression "Large and In Charge", Saturday's Brewer game was it. 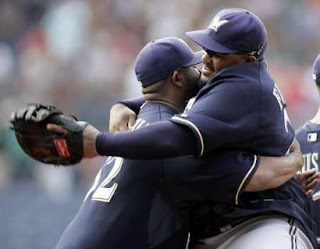 Of course, we all know it takes 25 guys to win a baseball game, but the only two that really mattered today were the Brewers big boys Prince Fielder and CC Sabathia. With those two leading the way, the Brewers won their 8th straight road game in beating the Braves 4-2. I was a little nervous about this one as the game progressed, because even though Sabathia was his usual brilliant self on the mound, the Braves' Charlie Morton was somehow pitching better. In fact, at one point Morton had retired 15 straight batters, at least until Prince took the first pitch of the 7th inning deep into the stands to tie the game 1-1. Later that inning the Braves chose to pitch to Jason Kendall instead of putting him on to get to CC, and Kendall made them pay with an RBI double scoring Corey Hart. Prince added a 2 run shot in the 8th to make the game 4-1. Sabathia would go eight innings deep, as he improved his record to 5-0 as a Brewer. Salomon Torres did give up one run in the 9th, but went on to earn his 21st save of the season. As tough as the Astros and Cubs series were, it's been really good to see the Brewers win these two games. Remember, this is a team built to win now, and it's something they are capable of doing, we all know that. The fun part will be watching them get there. Also, for your entertainment, here's a nice Q&A with CC Sabathia done by Yahoo! Sports.